Lima or Miami? | Blog the world!!! Sometimes you arrive at a city and fall in love with it, sometimes you hate it and sometimes it surprises you in a way you’d never expected. Lima is a long way south of Miami, it’s 7 or 8 (depending on which border you use) countries south of the US. But when you head to Miraflores you could be forgiven for thinking you’d missed your intended destination and arrived in the big, shiny states. Now I haven’t actually been to the US, but I have seen CSI Miami, and Miraflores (the beach area of Lima) looks just like it… but with less guns and murder. Miraflores is the affluent part of Lima, full of jogging expats and rich locals in fancy suits. It’s also packed with tourists all filing into the huge shopping centre built into the cliff. Oh and need I mention, there’s a picturesque pebbly beach to sit on. It also has some awesome surf or waves or whatever the word is for the kind of sea surfers like. We enjoyed a stroll along the beach, took some pictures of the pier (which looks a lot like the one in Clevedon, Tim’s home town close to Bristol) and enjoyed an ice lolly on the pebbles. 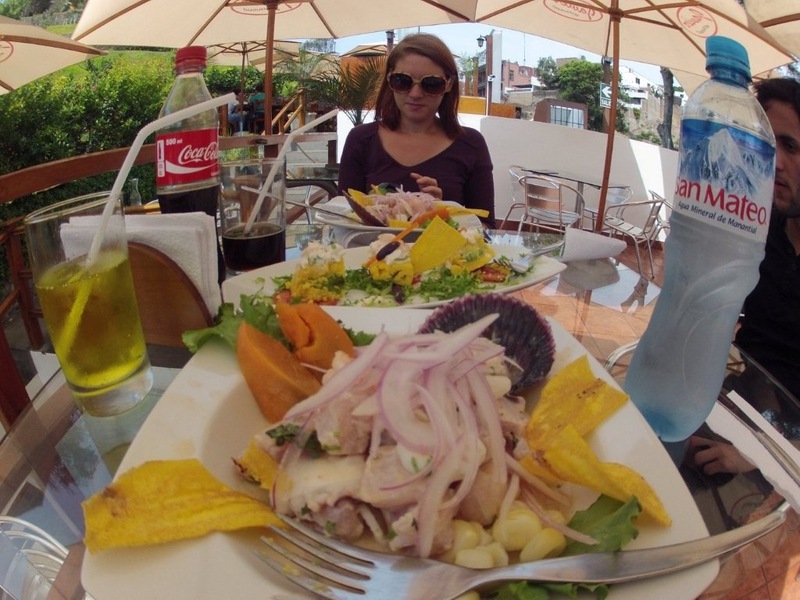 But then we were hungry and Miraflores is a long way out of our price range. So we headed to the bohemian district of Barranco. Barranco is the complete opposite of big shiny Miraflores, it looks exactly as you’d expect South America to look. Colourful houses, cactuses and people playing banjo type instruments in the street. Even better it has plenty of restaurants and hostels. We chose a rooftop restaurant that overlooked the sea. It was still quite expensive for us, but half the price of Miraflores. It was also the setting for our first Ceviche – Peru’s favourite dish. Ceviche is a dish of mixed raw fish in a tangy lime sauce and everyone in Peru will try to get you to eat it. We took the plunge. I don’t enjoy eating raw fish, I’ve only just come round to cooked fish, but for some reason I’ve consumed a lot of it on this trip. As with the other dishes, I loved the sauce… I just wish they’d give me something non slimy to dip in it. Once we finished our lunch, we had another wander around the area before heading back to the Historical district where we were staying. Wandering around the historical district is completely different again, in fact you could be forgiven for thinking you’d missed your intended destination again and ended up in a strange universe where Spain and London merge. There is a palace that holds a changing of the guard ceremony, similar to the one in London and big colonial buildings with fancy Spanish balconies. It’s also a great place to get cheap street food. My favourite is the papads – a large fried mash potato croquette type thing with mince and onions inside. But we also tried another Peruvian speciality, beef hearts on sticks. It is surprisingly tender and, if you like meaty meat, rich and delicious. I think it could be compared to liver, but you’ll have to judge for yourselves as I’ve not managed to get past the smell to really try it. So that concludes our journey of Lima, a big city, but well worth a visit all the same.